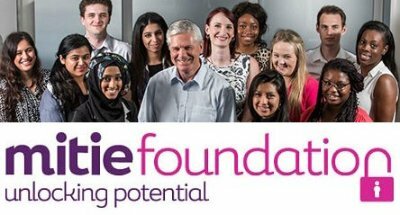 The Mitie Foundation is committed to helping individuals with barriers to employment. Their community-based activity is focused on employability, education and enterprise and is geared towards supporting people from all walks of life to increase their chances of employment. Access to education and training is essential to help unemployed individuals gain experience to improve their future prospects. The Mitie Foundation has created a number of programmes to bridge this gap. Through their Skills Centres, located in schools in Airdrie, Sunderland, Birmingham, Bristol and Hackney, receive substantial support each year with PPE and building materials, as well as career events supported by volunteers from strategic outsourcing business Mitie. Over 300 young people each year study BTEC in construction-related skills. People with learning difficulties or a disability are supported into employment using Employer Engagement Days, matching 30+ candidates with 15+ local hiring managers. Four such events were held in 2017 and six are planned for 2018. Adults are supported by the Mitie Foundation's Ready2Work programme, which helps unemployed individuals gain seven weeks' work experience either with a Mitie business, one of their clients or a partner organisation. This environment provides them with a much-needed confidence boost and helps them realise that there is a place for them in the job market. Over 70% of candidates who have completed the programme in recent years received employment offers. Throughout 2017, Mitie facilitated 28 business challenge days in prisons across the UK, guaranteeing interviews for all participants and introducing 700 candidates with criminal records to potential local employers. The support provided by Mitie during these business challenge days help prisoners realise their potential and widen their career aspirations, whilst informing them of opportunities available to them and highlighting how they can best prepare themselves for interviews upon release. Not only this, but the Business Challenge Days also provide employers with a valuable education opportunity, demonstrating the untapped resource that can be found in prisons. In witnessing the talent, drive and dedication of prisoner populations, employers are encouraged to seriously consider ways of improving their businesses by employing individuals with criminal records. 'These Business Challenge Days are exactly the kind of scheme we need to show employers just how valuable ex-offenders can be.' Former Prisons Minister, Andrew Selous, MP. In the Summer of 2017, Mitie was involved in creating a social enterprise in HMP Sudbury. The Garden Centre, Cafe and Academy trains prisoners in a multitude of skills, including horticulture, landscaping, hospitality, retail, food hygiene and customer service skills. This scheme provides individuals with valuable, first-hand experience, whilst improving their prospects for employment upon release. Experiences such as this are likely to enhance prisoners' chances of successful rehabilitation and desistance, as it provides them with practical skills that employers look for. By participating in projects such as this, individuals have the opportunity to experience working life and prepare for resettlement in the community. The Mitie Foundation successfully initiates a dialogue between all parties in the employment journey, by engaging businesses in their work with individuals who face barriers to employment. Their work helps people with criminal records to feel supported, confident and driven; whilst demonstrating to employers why it makes smart business sense to employ ex-offenders. In the coming years, their work in prisons is set to expand to ensure that more prisoners, and those released under licence, than ever before are provided with the right support and encouragement to secure employment and turn their lives around.